Hardcover, 160 pages, 17.3 x 22.0 cm, 6.8 x 8.7 in. How does an interreligious dialogue succeed? Without a doubt, the world's population is growing. It is expected to reach the ten-billion mark within a few decades. Global pressure is increasing for different cultures to find ways to get along with one another. The question then becomes who the people of other cultures actually are, how they live, what they think and what they believe. This is where the Via Integralis comes in. 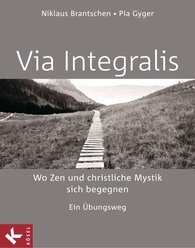 Founded by Niklaus Brantschen and Pia Gyger, this three-year course deepens the dialogue between Christianity and the "spirit of the East" (Buddhism / Zen).